This book is a call to action for those seeking to live extraordinary lives and bring about transformational change. When National Geographic Chairman Jean Case set out to investigate the core qualities of great change makers, past and present, from inventors to revolutionaries, she found five surprising traits all had in common. They weren’t wealth, privilege, or even genius. It was that all of these exceptional men and women chose to make a “big bet,” take bold risks, learn from their failures, reach beyond their bubbles, and let urgency conquer fear. Throughout Be Fearless, Jean vividly illustrates these principles through storytelling—from her own transformational life experiences, to Jane Goodall’s remarkable breakthroughs in understanding and protecting chimpanzees, to celebrity chef José Andrés’ decision to be a “first responder” and take his kitchen to the sites of devastating hurricanes to feed the hungry, to Bryan Stevenson’s ambitious efforts to end incarceration inequities, and more. She shares new insights to stories you might think you know—like AirBnB’s tale of starting from scratch to transform the hospitality industry, to John F. Kennedy’s history-making moonshot—and gems from changemakers you’ve never heard of. Weaving together storytelling, practical tips and inspiration, Be Fearless will teach you how to put the five fearless principles to work so that they too can spark the sorts of remarkable breakthroughs that change the world. Jean Case, the first female Chairman of the National Geographic Society in its 130-year history and CEO of the Case Foundation, is a philanthropist, investor, and internet and impact investing pioneer who advocates for the importance of embracing a more fearless approach to innovate and bring about transformational breakthroughs. Her career in the private sector spanned nearly two decades before co-founding the Case Foundation in 1997. Before the Case Foundation, she was a senior executive at America Online, Inc. where she directed the marketing and branding that helped bring AOL to the masses. In addition, Jean currently serves on the boards of Accelerate Brain Cancer Cure (ABC2), the White House Historical Association, and BrainScope Company, Inc., as well as on the advisory boards of the Brain Trust Accelerator Fund, Stanford Center on Philanthropy and Civil Society and Georgetown University’s Beeck Center for Social Impact and Innovation. She was elected to the American Academy of Arts and Sciences in 2016 and has received honorary degrees from Indiana University and George Mason University. 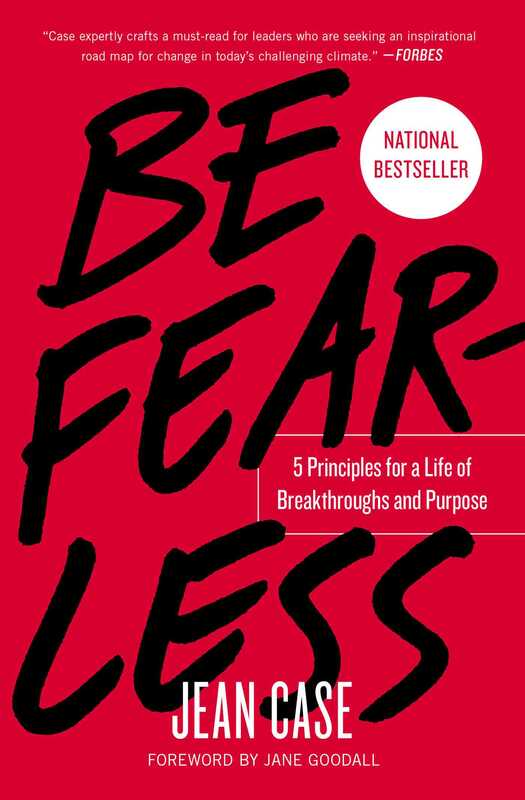 Be Fearless: 5 Principles for a Life of Breakthroughs and Purpose is her first book.